Doesn't everybody wish that they had access to a personal coach for their questions about training and fitness? Road Bike Action recently caught up with Johnathan Edwards, M.D. Dr. Edwards is a practicing sports doctor and anesthesiologist in Las Vegas, Nevada. He has been a sports doctor for American cyclists as well as in Europe. He is a USA Cycling certified level 3 coach and has worked with athletes during the Paris Dakar rally. As a former professional motocross racer and current Cat 2 road racer, he understands the health and training needs of cyclists of all levels. I am 25 years old and often get lower back pain while cycling. What can I do? This is a common problem in cycling that is seldom discussed. There are many causes of back pain in young cyclists. 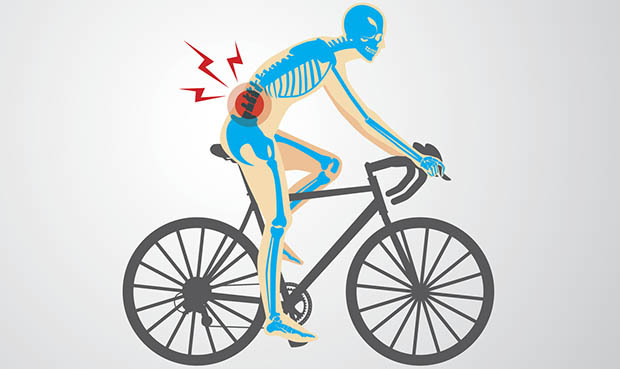 To answer the question, lower back pain in a young cyclist without any other problems or history of back pain is often due to mechanical factors (versus intrinsic problems inside your body). The most common is bike fit, then bike fit and then bike fit. In my experience, many cyclists are riding bikes that are too big for them and many cyclists lack proper flexibility and/or their core strength is lacking. Take the time and have your bike fitted to your body. Back pain can also arise from anatomical causes like leg length discrepancy or misalignment of your spine. So much of what cyclists do is hunching forward—working on computers, riding bicycles and eating at dinner tables all contribute to bad spinal health. Poor spinal health is common in young cyclists and often due to bad posture (on and off the bike) and injury. If you favor one side of your body or the other due to injury or poor posture, your back eventually takes the strain. An imbalance in the spine will cause overuse of the lower back.